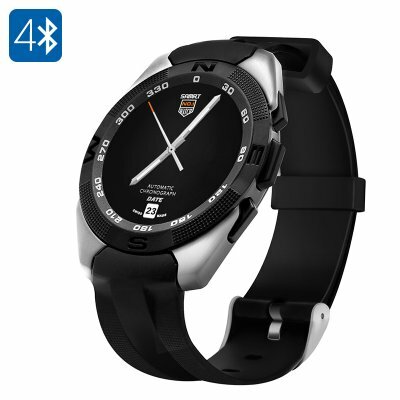 Successfully Added NO.1 G5 Smart Watch - Bluetooth 4.0, Smartphone Sync, Heart Rate Sensor, Pedometer, Sleep Monitor (Silver) to your Shopping Cart. The No.1 G5 Bluetooth smart watch puts the functions of your phone directly on your wrist. With its aesthetically pleasing design and packed full of functions the G5 smart watch is a real winner for its low price. Featuring heart rate monitor, pedometer, sleep monitor and sedentary reminder the G5 will take you step by step to a healthier life letting you track workout sessions, ensuring you get enough rest and curbing those lazy tendencies you may have. If you need some motivational music to accompany you then the G5 smart watch can provide that as well by syncing with you Smartphone you have access to all this and more. Paired with your iOS or Android smart phone the G5 Bluetooth smart watch lets you answer and make calls without getting your phone out, it will also double as a remote camera trigger so you can get everyone in those smart phone shots. Social media alerts will also be just a glance away as the phone can notify you of twitter, WhatsApp and Facebook updates so your never out of touch with family and friends. There's no chance of you leaving your phone behind as the anti lost feature on this smart watch will alert you if your cell phone moves out of range and thanks to is great paring functions you needn't even take your phone out other than to charge it. This Bluetooth Smart watch comes with a 12 months warranty, brought to you by the leader in electronic devices as well as wholesale smart watches..
Arabic: - مشاهدة الذكية رصد معدل ضربات القلب - Chinese Simplified: - 心率监视器智能手表 - Czech: - Srdeční frekvence monitoru chytré hodinky - Dutch: - Hartslag Monitor Smart Watch - French: - Heart Rate Monitor Smart Watch - German: - Heart Rate Monitor Smart Watch - Hebrew: - קצב הלב צג שעון חכם - Hindi: - हृदय की दर को मॉनिटर स्मार्ट द - Hungarian: - Heart Rate Monitor intelligens óra - Italian: - Cardiofrequenzimetro da polso intelligente - Japanese: - 心拍数モニターのスマートな腕時計 - Korean: - 심장 박동 모니터 스마트 시계 - Malay: - Jam tangan pintar Monitor kadar jantung - Norwegian Bokmål: - Pulsmåler Smart klokke - Romanian: - Ritmului cardiac Monitor ceas inteligent - Russian: - Смарт-монитор сердечного ритма смотреть - Spanish: - Smart pulsómetro - Thai: - ตรวจสอบอัตราการเต้นหัวใจดูสมาร์ท - Turkish: - Kalp atış hızı monitörü akıllı izle - Vietnamese: - Heart Rate Monitor Smart Watch. shipping somewhat slow but great news, I received it finally. works perfect, no problems. I was pleasantly surprised! This watch exceeded my expectations. Exellent design. Lost of features. Super bright touch screen. Exellent battery life. Packaging and delivery was absolutely outstanding!